(Jennifer) I am here because someone heard the Voice and said yes, I will, I will be what You’re asking me to be, as difficult as it is. (M) I can’t tell you what it means to me, Jennifer, that you know it was the Holy Spirit and not me, because we were sitting there, and the Lord so came on me and rose up in me, and began to name the issues. And you received it in the most incredible way, as love; but you knew also that it really, I was simply a vessel. I think that if I participated in it at all, it would have been wrong, and it would have been violence to you. If it had been ‘me’, it would have been cruel. I really didn’t feel that way. It was strictly the Holy Spirit taking control. I want to tell you what’s behind that. I read the book of acts, and I read about, I think it was Peter confronting Simon the sorcerer, and the terrific confrontation he gave when they rebuked the demon in the girl that was making money by witchcraft. The striking a man blind, those things were a confrontation of evil. Acts is the basis of the Christian life. It’s the model, it’s the standard. It’s an awesome standard. They were put in jail and they sang and the chains fell off. The earthquake happened. All those marvelous, miraculous things happened, and I cried out to the Lord, where is that today? That is the norm. We are nowhere near the norm. Where is the terrific power to confront evil in a person and set them free? Where is that? Well, He gave it to me somewhat. I cried out for it. I wasn’t crying out for it for me. But it has happened to me a number of times, and I do know it’s unusual and we’ve never told about it before. But my passion for this kind of power of God to confront and defeat evil is in me, because there’s no… I’m sure that kind of first century, book of Acts life is out there. But it’s come among us. And it has been, it’s been exposing and healing, and restorative, just as you say, Jennifer, and most everybody in this little Body. For some would not take it. And if I did it, it would be heinous. It would be as evil as the evil it’s going after. (J) That’s precisely it. I have watched people that have taken when you’ve confronted them, and then they’ve felt like they had liscense to go confront anything in their life. And then they did it in their own logic, and they said, this is wrong, I’m dealing with this. You need to understand that you were underpinned, Jen, with a blanket and a net of love prior to this ever coming. It was not like you just came and slapped her. (Jennifer) No, there was relationship. (J) There was relationship, and there was an under girding of love. I don’t believe that it was just the piercing. I believe there was a carriage that was built underneath you that you could even tolerate the piercing. And you had a proven track record of someone standing with you and loving you even though you knew that you were… your heart was cold and ‘off’. And then when the piercing came, you could fall right into that, and it gave you the ability to fall into that. And it has to be all, the entire thing. I don’t care what it is, has to be all the Sprit’s leading. You have to be completely dependent on when He does bring the love, whatever way He brings it. And if you choose, because you say this is wrong and this needs to be dealt with now, and you stand up, then you’re off. (M) Well, I’m reading this morning. We were, talking about vision. And when the Lord gives you love for a disciple or a follower, He gives you a vision of what they are to be, not a condemnation for who they’re not. He gives you a fierce passion for that person to be all they can be, and when you fall short of that vision, it’s not to be condemned, it’s to say, no, no, no, this is not you. You can be something else. So the correction is: it may be fierce, it may be hot, it may be full of the zeal of the Lord, which zeal is something burning. The real root of that is burn. But it’s not…though it may point out wrongs, even evils, the goal of it is not to crush or condemn, the goal is to bring you to be that glorious being that Jesus dreamed of you when He created you before the foundation of the world. It’s He in me has an intolerance, though a long patience to bring that vision about. Does that make sense? There’s a passion of Jesus for you to ‘get it’, to receive what He has for you that you can’t see. We’re little piddling sheep. We cannot imagine the wonder that He has for us. And I often call this kind of thing, you’re standing in front of a train, you don’t see it coming, you’re deaf to the sound of it and I’m screaming at you to move, and save your life. So, but you have so, you and John and these people have so seen it as the love of God reaching out, not to crush you, not to hate you, but to hate the evil that you’ve chosen, and the evil that you become by choosing evil. (Jennifer) That’s exactly it, the evil that I choose that I am absolutely one hundred percent responsible for, accountable for, and there’s no nudging that. But I am stupid. I am a stupid sheep, a stupid human created to be a vessel. I open the door to things I can’t comprehend. That’s how we work. And so the other part of that, of this wrathful confrontation, this incredibly fierce and frightening confrontation of somebody is… you don’t know that that’s not precisely what’s required because you don’t know the size of… We’re dealing with principalities, not people, so you don’t know the size of what this person has let in, and not unwittingly as in they didn’t choose it. Of course they chose it. Unwittingly as in, we don’t even know the fullness of what we choose. We’re stupid, ok, and we don’t get it. We don’t, we really, really don’t. And I say that as someone who’s completely responsible for everything that happened as a result of my choices, but also that I had no idea that that was the fullness of what I was allowing and unleashing and being. Ok? That’s what I mean. That, that very stupidity and ignorance, which is to say we were never meant to be in that kind of high wisdom. We’re vessels. We have either the Lord’s wisdom, or we have the enemy’s dark whatever. I don’t really want to call it wisdom. So, we don’t know what’s required to hit that principality that has been embodied in, that is now roosting there. Ok? So we start out, and we say oh, we’re in control, and this is how I’m going to deal with this, whatever, and we end up in a prison of our own making. And the Holy Spirit knows what’s required to bust that wall open, we don’t. We might look at somebody and they seem like a sweet, innocent little person, and we say Lord, if I yell at this person that’s just going to break them. It’s been so hard, their heart is so tender that there’s no possible way. I don’t know, I don’t know what has them ensnared. I don’t know. And if the Holy Spirit, and it’s always about the Spirit. If the Holy Spirit is telling you something, I call it ‘the pushing against the back of the teeth.’ That’s how I know. For people out there who say I just really don’t know. (Jennifer laughs) When the Holy Spirit is lit up in me, and wants something to be said, I’ll say, ok, I’m not sure this is You, I’m not sure this You. Ok, be quiet Jennifer, it’s probably just you. You’re always trying to talk. You’re always trying to say something. It’s ridiculous. Just be quiet, just be quiet, just be quiet. And it pushes against the back of my teeth until I must speak. And I trust fully, and if the worst thing that happens is I apologize, what is that in the big scheme of things? So I go to somebody and I say, yep, I annihilated you and that was totally me, and please forgive me; I was completely wrong and totally sorry. The world doesn’t end, ok? My life doesn’t end. But if what’s at stake is the eternity, and when the… what Christ wants? What He’s trying to use me to do, to get? What is an apology in the big scheme of things? Shoot my pride, oh well, (Jennifer laughs) yep, sorry. (M) I want to tell the, I want to give the result of it that Jennifer cannot see, just as you can’t see the evil, you also can’t see the presence of the Spirit. And this week I’ve had a morning with the Lord and I just suddenly went back over some things that Jennifer had said. We’d had a little spontaneous church, twice, and both times Jennifer had had things to say that I had not seen, a whole different aspect. And I was just marveling at the Lord in her. So I wrote her this note, “Dearest, This morning I’m fascinated with Christ in you, His thoughts, His knowing. I’m amazed at the insights and sights and sounds He reveals to you. How invaluable you are to me, to the Kingdom, to this message of Him in us.” And that just expresses who she is among us now. She’s an expression of Him. She’s not aware of it. Most of us are not aware that we have any value. We probably don’t think we have any value. But I just, I’m so hungry for the Lord, that I’m hungry for the Lord in her, because He’s not like the Lord in me. He comes with different thoughts to her. That’s church. That’s the wonder that has come out of that confrontation, and of your bowing, and of your seeing it as this fierce love. So, the result of it is transformation, where you can’t even see how magnificent He is in you. Even in this podcast, you’re willing to bear your soul for the church. (M) You’re willing to let it be known for the church. And you had great sympathy for me, because it was so costly to me. It took me hours and days to recover from the power of the Spirit that came through there. You had empathy for me. That’s amazing too. (M) That doesn’t always happen. (Martha laughs.) So it’s just, it’s filled with wonder in the end; evil is conquered. Evil is sent away. 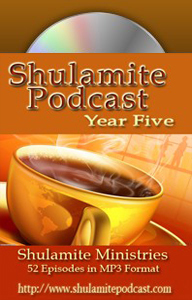 Shulamite ministries would like to inform and invite you to download the new Shulamite App, available for iPhone, iPad, and iPod Touch. Experience your podcast, and read articles that jump-start your moment. 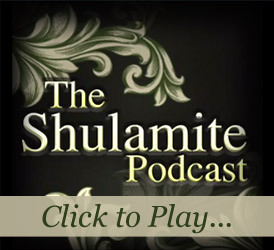 The Shulamite App, stay connected to the ministry on the go, or at home, right in the palm of your hand.